October 11th 2014: We've published an article devoted to the syndrome of new ponds. October 25th, 2011: We've gladly published and answered first question left by one of our visitors! It's located under the Building a Koi pond article. You're welcome to ask too! September 24th, 2011: We've finally updated the layout! September 4th, 2011: Our last article is Useful fish pond equipment and treatments. Meanwhile we're working on layout, adding and taking new photos. August 29th, 2011: A collection of garden plants pictures has been added today! Even pond surrounding area requires attention and garden plants are ideal for enhancing the feelings. August 26th, 2011: Sturgeon fish in the fish pond - Care and Tips has been added recently! August 25th, 2011: How to save money on food for your goldfish in the fish pond is the latest article! August 25th, 2011: Our server was down between 18th - 20th August due to HDD failure. Everything has been restored from our backups and now works properly! August 13th, 2011: Goldfish article was published, we also published a lot of new photos and we're going to take even more of them! August 7th, 2011: The layout is going to be updated really soon, new pictures are going to be added to every article too! August 7th, 2011: Origins of the Koi Carp and how to breed these beautiful fish is the newest addition! July 27th, 2011: Feeding your pond fish is the latest addition that helps understand feeding requirements and habits of pond fish. July 18th, 2011: Diseases of pond fish was written and added today. It contains all common diseases and recommended treatment. July 12th, 2011: Stocking your fish pond was added - the article describes most common and recommended fish species for raising in ponds. July 8th, 2011: Designing a fish pond article was added today. Jun 18th, 2011: Fish pond skimmers article was published. Jun 8th, 2011: Maintenance tasks and schedule article was added; Describes everything that will secure a pond to be well-maintained. Jun 4th, 2011: Water quality in the fish pond was added in order to explain water chemistry and related processes in fish ponds. May 30th, 2011: Vacuuming a fish pond was added in order to explain the purpose and benefits of using fish pond vacuums. May 26th, 2011: Fish pond fountains was added recently, the article describes use and purpose of fountains in ponds. May 21th, 2011: Fish pond waterfalls is the latest article that explains how to build waterfalls in fish ponds. May 13th, 2011: Building a concrete Koi fish pond is currently the newest article, it also contains pictures. May 9th, 2011: The latest article here is named fish pond plants. May 1st, 2011: How to cycle a fish pond is our newest article as of today. April 28th, 2011: Another article has been added, it's devoted to fish pond filtration! April 20th, 2011: Our newest article was added here; Fish pond liners! April 14th, 2011: Our second article was published here; It's called Building your fish pond! Recent news: We're done with some images, they're going to be published here very soon. 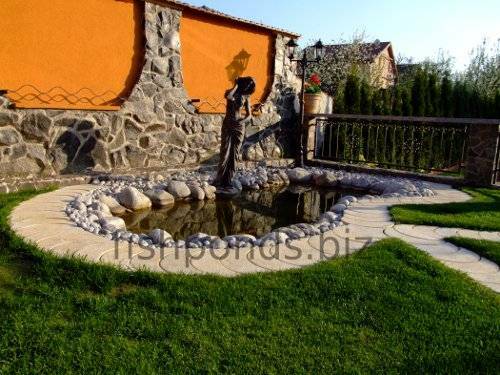 We also added our first article: Fish Pond Aerators! More articles are coming soon, additionally we're going to integrate some nice layout to these pages! Thanks for stopping by, the FishPonds.Biz website is going to list new articles as soon as possible. We're currently working on articles and photos. Copyright © 2019 FishPonds.Biz . All Rights Reserved. Designed by Jan Hvizdak.